Pet of the Week is a weekly feature that highlights a pet available for adoption from D.C.'s Humane Rescue Alliance. Meet Mr. Wiggles! This 7-year-old pup came to the Humane Rescue Alliance from Fort Worth, Texas, as part of HRA’s transport program and is ready for a new life here in the District. 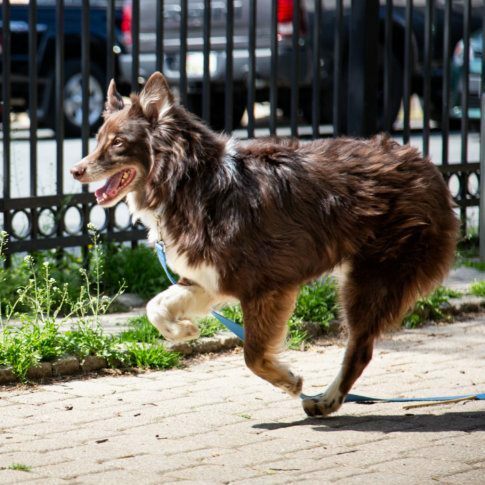 Mr. Wiggles loves people and would do well with other dogs who are a calm and easy-going, like him. This tripod pup may only have three legs, but he doesn’t let that slow him down! True to his name, he’s wiggly, friendly, and fun, and is ready to meet his match. Take a look at our 2018 pets, and where they are now. The Humane Rescue Alliance (formerly the Washington Humane Society-Washington Animal Rescue League) has protected and served the community for more than 145 years and serves more than 60,000 animals annually. The broad range of programs offered include: rescue and adoption, humane law enforcement, low-cost veterinary services, animal care and control, behavior and training, spay-neuter services, humane education, and many others. The organization is dedicated to ensuring the safety and welfare of all animals, bringing people and animals together, and working with all communities to support these relationships. HRA is based in Washington, DC, the only major urban area in the country that has all of its animal protection programs and services unified in one organization, making the Humane Rescue Alliance a model for the nation. Humane Society of Charles County offers a low cost spay/neuter program to the public. Please call or visit our website for more information. The shelter is also looking for more foster parents to help its animals. Prince George’s County Humane Society is also looking for foster parents. For more information, contact the organization. Approved applicants may attend monthly adoption meets that are usually held at the house of a volunteer in either Northern Virginia or Southern Maryland. Lab Rescue of the LRCP is a volunteer driven, nonprofit organization that rescues, fosters and places homeless, abused, and/or abandoned Labrador retrievers. Lucky Dog is a foster home organization and does not run a dedicated housing facility. A Forever-Home is a nonprofit dog rescue group that operates in the Northern Virginia/Washington Metropolitan area. All visitors must speak to a Friends representative before receiving directions to their shelter location. 2650 S. Arlington Mill Dr. Arlington, Va.